I was stoked when Jolie picked kale because I keep running into cool articles all about kale and its health benefits. I asked my brother the other day if he's ever had kale and his was response was "Yeah, that's the stuff we'd use as garnish for the salad to make it look pretty." Unfortunately Popeye didn't eat kale so we (I) never realized how superfoodie it really is until recently. Now that I think of it, Popeye needs to make a comeback. Hollywood is remaking every other childhood cartoon in theaters; maybe a superhero who gets strong and awesome from eating his dark, leafy greens should be next. Pleeease, for the sake of my child! I really do like kale. I only got a small taste of Emily's peanut sauce kale salad and I'm still dreaming about it. But the kiddo gives me a tight-lipped, vigorous head shake when I present anything green to him. So I went a different direction and tried to hide kale in foods I thought he might eat. Hard to notice that slushy green drink behind such a pretty nail, I know. Sally Hansen's "Wined up" in case you wondered. My toddler loves the smoothies and I don't even add sweetener. It makes me feel like a superhero when I see him chugging one down. The other way I sneak attack kale or spinach into his food is by stuffing it into a grilled cheese sandwich. A green smoothie with kale grilled cheese sandwich -- meal of champions. I tried to get a little more creative with kale than just smoothies and grilled cheese, so I decided to stuff it in an appetizer I wanted to try for the Super Bowl. And since I was heading to Emily's to watch the game, I knew she'd be down to eat some kale with me. In fact, kale made an appearance in pretty much everything we ate that day, thank you BATF. Pictured here are the SW Egg Rolls, Avocado-Sour Cream Dip and some rolls stuffed with Emily's leftover Butternut Squash Sausage filling -- with kale added. Mmmm. Mix all ingredients together. Spray pan and line with egg roll wrappers. Brush egg white on top of wrappers and fill with mixture. Roll wrappers, tucking in corners as you go. Brush more egg white over top of roll. Cook in 425 degree oven for 15 minutes, turning once, until slightly browned. Make your rice according to package directions and if the instructions call for the rice to simmer, add the peas to the pot then. Add cooked rice, peas, kale and chicken to a bowl and mix together. Spray pan and line with egg roll wrappers. Brush egg white on top of wrappers and fill with mixture. Roll wrappers, tucking in corners as you go. Brush more egg white over top of roll. Cook in 425 degree oven for 15 minutes, turning once, until slightly browned. The theme here is you can go wild with egg rolls and smoothies and be as inventive as you want. Plus, they mask the healthy stuff really well. I'm happy to give this post the seal of "kid" approval. Enjoy! Little Popeye is so cute! Maybe if Hollywood doesn’t come thru, you can write a children’s book featuring J-Bud and kale. Your egg rolls rocked! 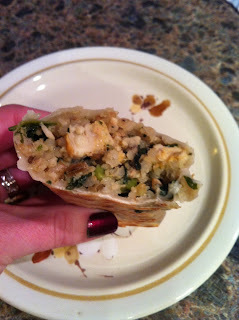 And I love how creative you can get with the fillings… having chicken, wild rice and kale egg rolls as a main dish sounds delicious (and healthy)! Great post, Missy! And, thanks for the painted nail inspiration. I really thought: wow! pretty nail! And then I read your caption. I'm inspired by the smoothy idea. I think the boys would love that. And it is so healthy! This all looks amazing, and I THANK YOU for three new recipes to try with my non-green-food-eating little one! I think I'm about to jump on the smoothie bandwagon, beauties!